First Baptist Church in Florence, Alabama is excited about reaching their community! 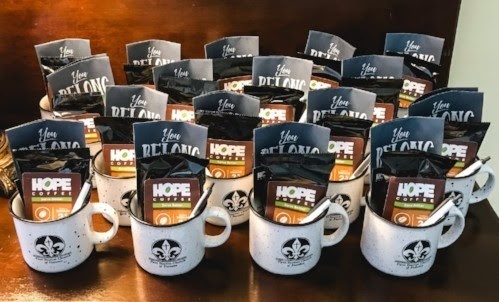 Each Sunday they welcome first time visitors to their church with a mug of HOPE Coffee! The beautiful mug features their church logo and contains information on how to get involved, along with a pen and a 2.5 oz. Retail Packet of our Honduran Medium Roast Coffee. Are you looking for a new way to welcome first time visitors? Our 2.5 oz. Retail Packets might be just what you are looking for!